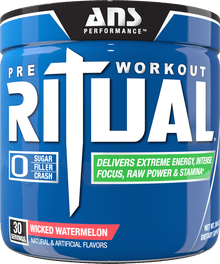 Mix 1 scoop of RITUAL™ with 6-8 oz of cold water and consume 15-30 minutes before training. Do not exceed 1 scoop with first use of product. Assess your tolerance to RITUAL™ prior to increasing dose. Dose may be increased to a maximum of 2 scoops for maximum effect (mixed in 12-16 oz of water). To avoid sleeplessness do not take within 4 hours of sleep. Read entire label before use. DO NOT EXCEED 2 SCOOPS IN ANY 24-HOUR PERIOD. Not intended for use by persons under 18. Do not use this product if you are nursing, pregnant, or attempting to become pregnant. Contains caffeine. Do not combine with other sources of caffeine or stimulants. Consult a medical doctor before starting any diet or exercise program. Consult a physician if you have any pre-existing medical conditions or if you are using any prescription or over the counter medication. Discontinue use and consult your health care professional if you experience any adverse health effects from this product. This product may contain ingredients banned by certain sports organizations. User accepts all risks, liabilities, and consequences in regard to testing. Use only as directed. Do not exceed recommended serving under any circumstance. Do not use if packaging has been tampered with. Store in a cool dry place. KEEP OUT OF REACH OF CHILDREN. Malic Acid, Sucralose, Natural & Artificial Flavors, Calcium Silicate, Citric Acid, Acesulfame Potassium, FD&C Yellow #6. Malic Acid, Sucralose, Natural & Artificial Flavors, Calcium Silicate, Citric Acid, Acesulfame Potassium, Fd&C Red #3. Malic Acid, Sucralose, Natural & Artificial Flavors, Calcium Silicate, Citric Acid, Acesulfame Potassium, FD&C Blue 1. Mix 1 scoop of RITUAL with 6-8 oz of cold water and consume 15-30 minutes before training. Do not exceed 1 scoop with first use of product. Assess your tolerance to RITUAL prior to increasing dose. Dose may be increased up to a maximum of 2 scoops for maximum effect (mixed in 12-16 oz of water). To avoid sleeplessness, do not take within 4 hours of sleep. Read entire label before use. DO NOT EXCEED 2 SCOOPS IN ANY 24-HOUR PERIOD. Not intended for use by persons under 18. Do not use this product if you are nursing, pregnant or attempting to become pregnant. Contains caffeine. Do not combine with other sources of caffeine or stimulants. Consult a medical doctor before starting any diet or exercise program. Consult a physician if you have any pre-existing medical conditions or if you are or if you are using any prescription or over the counter medication. Discontinue use and consult your health care professional if you experience any adverse health effects from this product. This product may contain ingredients banned by certain sports organizations. User accepts all risks, liabilities and consequences in regard to testing. Use only as directed. Do not exceed recommended serving under any circumstances. KEEP OUT OF REACH OF CHILDREN. Over the past few years, the pre workout supplement has taken on a completely new meaning. What was once something just used for some energy has now become so much more. It's no longer just about energy or pumps - it's a whole new mindset. Once you take your pre workout, the clock starts to tick. Game time is coming and there is no more messing around. It's time to suit up and get to the gym, and to get there with only one thing in mind - a monstrous workout. We all go through our routines before every workout. Get dressed. Grab your straps. Queue the music. Prep your post-workout protein. And before you hit the road, you mix your pre workout and take it down. At that point, there is only one thing left to do: get to the weight room and annihilate it. The pre workout has become the cornerstone of this routine. It is the point of no return. Once you take it, you had better be prepared, because it is coming whether you are ready or not. This routine is no longer just a "routine". It is a RITUAL. A ritual that we refuse to waste with a late start or a missed workout because "something came up". Especially when your pre workout is this damn good. This is the product we have all been waiting for. The pre workout that kicks all other priorities to the curb. The supplement that will have you go through hell or high water to get to the gym on time. You don't skip a Ritual. ANS is one of those young and aggressive companies that you need to look out for. Their relatively small product line uses only ingredients backed by proven science, and the reviews so far are extremely high. So when ANS decided to create a pre workout supplement, we knew it'd be very good. But there's tons of "very good" pre workout / nitric oxide supplements out there. We are looking for something that is downright great. 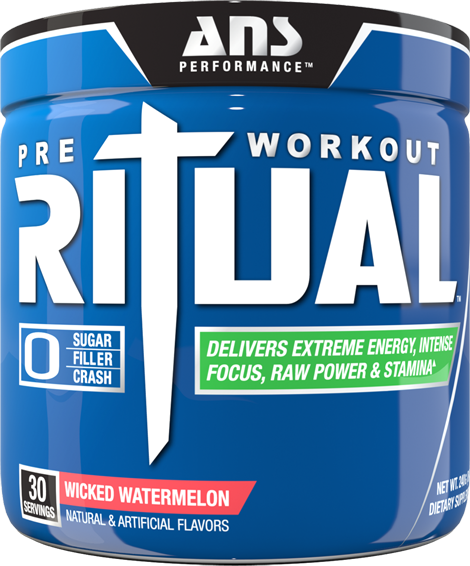 Our RITUAL Pre Workout Review is Here! You can read our ANS Ritual Review on our blog, too. This is an absolutely incredible "kitchen sink cocktail" of everything we love in a pre workout. The difference between the Ritual and the rest of them is that this one has nearly all of its ingredients in clinically proven dosages - nothing here is "pixie dusted". 3g L-Citrulline for further, longer-lasting nitric oxide pumps and endurance support (Quercetin Study as an NO "Protector"
N-Acetyl-L-Tyrosine for increased energy, focus, and alertness, as it is an incredible precursor to the hormones / neurotransmitters epinephrine, dopamine and norepinephrine. Higenamine (Norcoclaurine) for natural fat-burning and increased thermogenesis (energy output from extra heat). The biggest question will be how well the DN1000 (dendrobium extract) operates, and time will tell as we see ANS Ritual reviews come on board. Dendrobium has been making waves, but there's no "standard" for extraction. The good news is that it makes you incredibly focused, euphoric, yet has been shown to be very safe. With such incredible ingredient doses like these, Ritual could not have been cheap to make or source, but as always, we'll do our best to get you the best deal with our price comparison widgets.